Last Day in Apache Junction . . .
And our last day with Nick and Terry for a while. I headed over to Nick’s a little after 9 so I could clean and protect his house battery terminals. The positive terminals had a good bit of corrosion on them, though the negative poles were pretty clean. 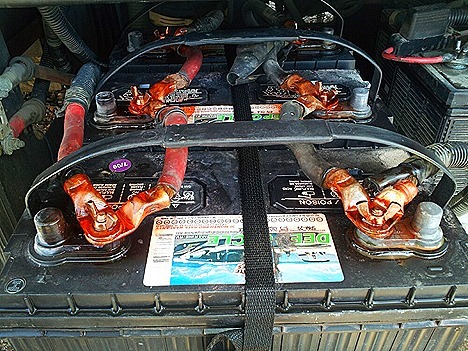 Nick turned off the battery power to the coach, and then I removed all the wires, scrubbed them with a wire brush, and then sprayed everything with NAPA Battery Cleaner. After letting them sit for about 10 minutes, I scrubbed everything again with the brush, and then sprayed it again with the cleaner. This time nothing turned from yellow to pink so I knew I had all the corrosion off. Next I put everything back together and tightened it down. Then it was time for two coats of NAPA Battery Terminal Protector, and then everything looked nice and shiny like this. I’ve used this terminal protector for years and it does a really good job keeping them clean if you’re careful to get all of the corrosion off to start with. Getting back to the rig about an hour later, I made coffee and Jan and I enjoyed our last day in Apache Junction. Then about 1pm we headed over to SanTan Village for a Sam’s Club and Wal-Mart run. Finally getting back to the rig about 3 I started getting some outside things packed away for our departure tomorrow. About 4:30 we picked up Nick and Terry and headed out to try Elvira’s Mexican Food, a place Terry had liked years ago when she lived here. And it turned out to be really good. Good enough that we kind of wished we had tried it earlier so we could have eaten here more than once. Since this was our last time with Nick and Terry for a while, we stretched out dinner as long as we could before heading back to the park. This may be our last time to see them this year, but we’re hoping we can meet up in Bend, OR in June if their schedule works out. We’ll just have to see. Tomorrow we’ll leave here about 9, get diesel at a CircleK two exits down, and then head for Las Vegas about 320 miles away. We plan on spending two weeks at the Thousand Trails park there before heading out for South Lake Tahoe and then Bend. Our next ‘hard’ date is the Escapade in Gillette, WY June 30 through July 5. A Last Goodbye . . .
After a quiet morning I headed a few exits down the freeway to Power Rd. and Discount Tire. I needed to get the leaky one fixed that started losing air on Friday. But luckily the leak was slow enough that I was able to air it up and then get down the freeway to the store. I had already figured out that I was going to have to get a new tire. The leak in this one was a blowout of a patch that was done while we were gate guarding in South Texas last year. And 45 minutes and $215 later, I was done and heading home, or at least, heading for Nick’s. I was able to mount it right above Nick’s computer desk and tie it into a light fixture overhead, so it’s always visible. We had also planned to clean his house battery terminals, but by now it was over 100 degrees, and since it would require disconnecting the house, which kills the AC and the fans too. So we’re going to hit it again early tomorrow morning. Getting back home for the afternoon, we picked up Nick and Terry about 5pm and headed back over to Red Robin so Nick and Terry could get their Red Robin fix like Jan and I did last week. Coming home I made a quick stop at Home Depot before getting home a little before 7pm. Normally Jan and I would have done our walk tonight but it was still in the 90’s so we called it off. 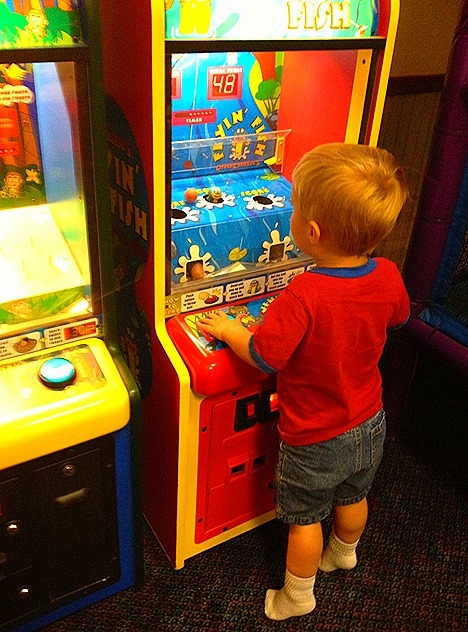 Brandi and Lowell sent over some pics of Landon having a good time at Chuck E. Cheese. I love this shot of him standing on his tippy toes so he can see better. 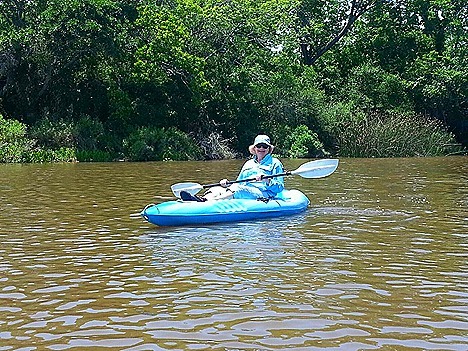 Our daughter-in-law Linda posted these photos of her and Chris kayaking on Armand Bayou in the Clear Lake area. Hope they’re watching out for all the gators that are in there. 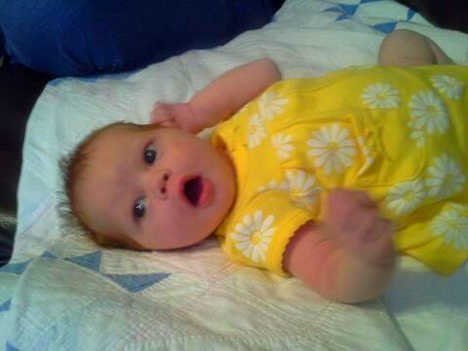 And wrapping things up, here’s another shot of Landon’s new 2nd cousin, Zoe. Love that red hair. And finally on a very sad note, our long-time close friend, Gina (Regina) Ellis died this afternoon. Her daughter Sharelle called about 7:30 to tell us the news. It was not unexpected, since Gina had been diagnosed with Stage 4 Pancreatic Cancer even before we left Houston in February, so we knew it was just a matter of time. We met Gina and her husband George in 1980 and quickly became fast friends. George, who died in 2004, worked at NASA at the same time I did. In fact, he was head of Crew Systems for Rockwell Aerospace for years, and worked directly on the Space Shuttle design in both California and Houston. Gina had a varied career of her own, starting as an executive assissant at NASA which is when she met George. Later on she was an EMT, and a police sergeant. And when she retired she was an investigator for American National Insurance in Galveston, investigating insurance fraud. She will be greatly missed by everyone who knew her. Flat, Not Flats . . . I spent a little while this morning putting up Reflectix across the full front windshield and it quickly made a difference in the heat coming in. It was supposed to make to 99 today, 100 tomorrow, and 98 on Wednesday, so our AC’s are going to need all the help they can get. 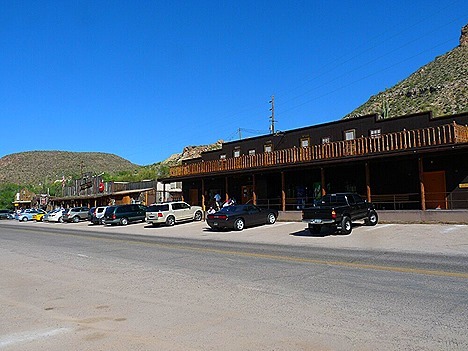 About 1:30 Nick and Terry showed up and we were off on our trip up into the Superstition Mountains along the Apache Trail and all the way out to Tortilla Flat. 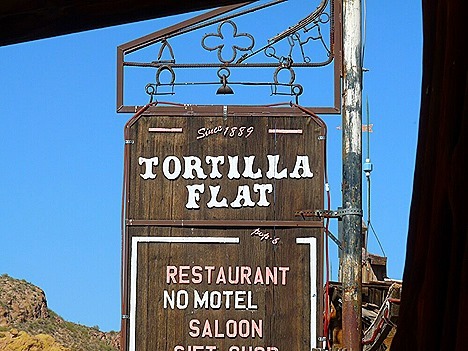 And yes, according to their website, it’s Tortilla Flat, not Flats. 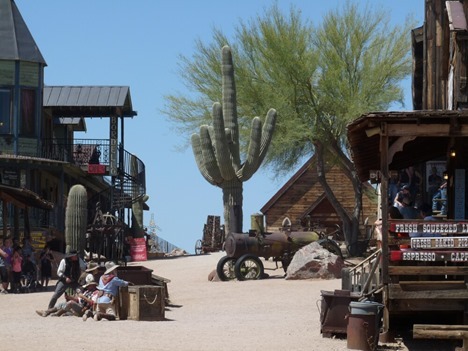 Leaving our RV park, we headed northeast on SR88 for about 6 miles and stopped off at Goldfield Ghost Town, an old 1890’s mining town turned into a tourist attraction. 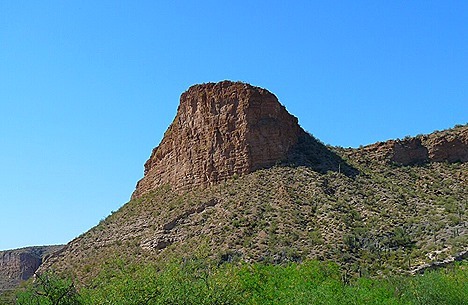 But the first thing you notice here is the great view of Superstition Mountain, a really imposing piece of rock. 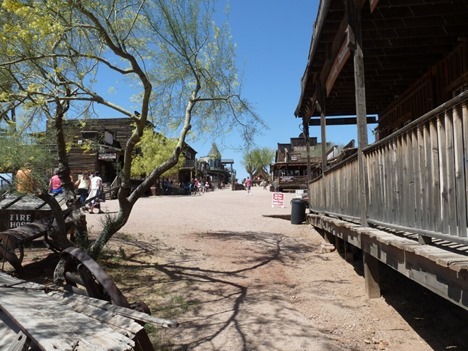 The town is built up the side of a hill, and reminded Jan and I of Calico Ghost Town over in California, near Barstow. 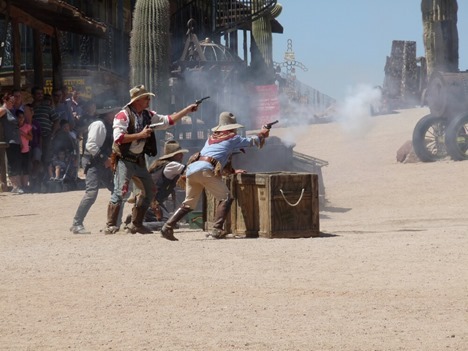 And like Calico, they have hourly gunfights in the streets. What started out as an argument over a money strongbox, progressed though a shootout, complete with a stick of dynamite, and ended up with a lot of bodies in the street, finished off by a shotgun-toting bordello madam. 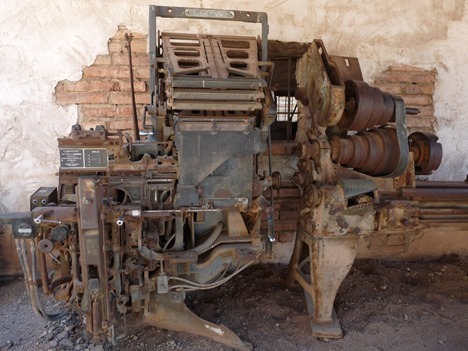 Down a side street we did come across this old, rusty Linotype machine, used in making up lines of type from molten metal, which are then assembled into printing plates for printing. 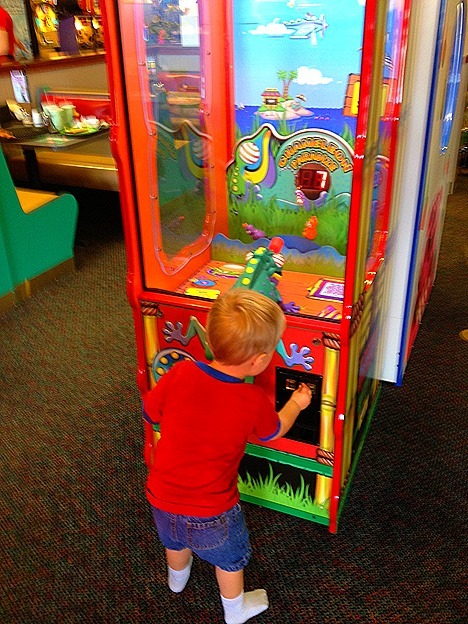 Of course the first thing Nick wanted to know was did I think I could get it working again. 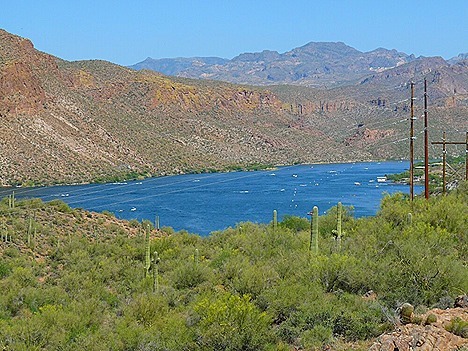 Canyon Lake, one of four lakes up in this area. 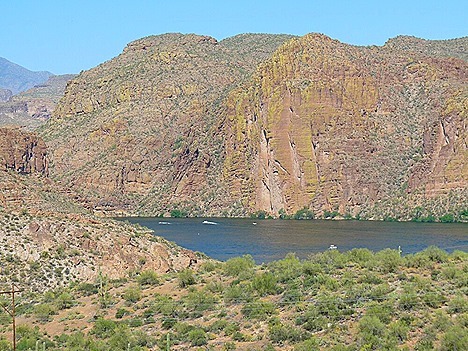 You don’t think about lakes like this in this part of Arizona, but there’s a lot of boating going on up here. While we were at the Canyon Lake Overlook, Nick noticed his Explorer was leaking antifreeze from around the bottom hose of the radiator. The engine wasn’t overheating, and there was still antifreeze in the overflow tank, so we decided to continue on to Tortilla Flat and check it out again. A few more miles down the road brought us to Tortilla Flat. And after you’re there, you find out that Tortilla Flat consists of 3 building, 6 stores, and has a population of 6. But there is a lot of pretty scenery in the area. After checking out the stores and gift shops, we had some ice cream, and then watched the other visitors come and go. While we were there, and again before we left, I checked the antifreeze leak again and found no sign of it. Still don’t know what happened, but it didn’t reoccur the rest of the trip. 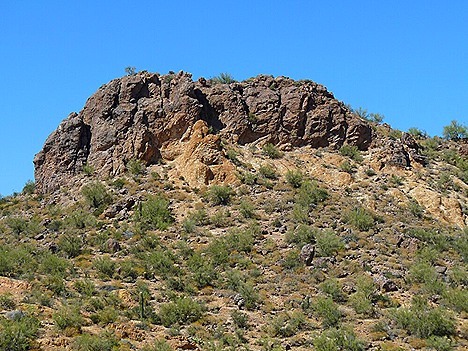 Getting back to Apache Junction, we tried to decide on a place for dinner. And after a lot of back and forth, and “I don’t know. Where do you want to go?”, we ended up trying out Black Angus Steakhouse. Nick and Terry had eaten here in the past, but it was a first time for Jan and I. They have 44 restaurants in 6 western states, including Alaska, but neither Jan and I had ever heard of them. And as it turned out, it was pretty good. Jan and I, and Nick all had steaks, while Terry had the Grilled Salmon. My steak had those slightly-charred edges that I like so much, so I was happy. And after all, that’s what matters now, isn’t it. Tomorrow starts our last two days here in Apache Junction, so I need to finish up a couple things on both Nick’s and our coaches. Zen is not easy. It takes effort to attain nothingness. And then what do you have? Nothing. Jan hasn’t been happy with her last few pedicures, so I’ve been drafted to fill in. I must have done a pretty good job painting them because Nick says I can do his next. 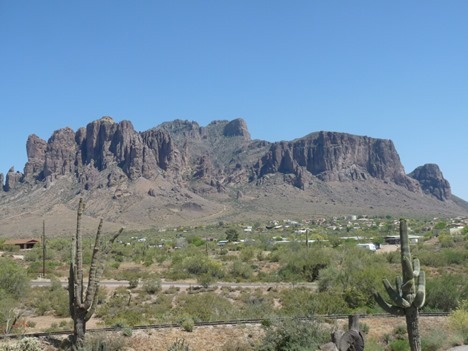 We had planned to do a day trip this afternoon up into the Superstition Mountains to check out Tortilla Flat and some of the old towns up in the mountains. But we ran into a couple of problems. I was originally supposed to drive, but found I had a leaky rear tire on the truck, so then Nick was going to drive. But right before they came to pick us up, they lost power at their rig. They had power at the pedestal, but it just wasn’t getting to the rig. Since we were expecting temps in the high 90’s today, it seemed like a good idea to cancel today’s trip and get Nick’s power working again. And a little checking showed us what it was. The big 50 amp twist-lock plug that connects the power cord to the rig was starting to melt. The plastic cover had burned through in a couple of places and wasn’t letting power into the rig. So our first chore was to find a new plug, and after checking Home Depot (only had 30 amp versions) and two RV parts places (both closed on the weekends) we ended up at a Camping World where they had the part. Getting back to Nick’s I started replacing the plug, and it didn’t take long to see what might have been causing the long-term problem. 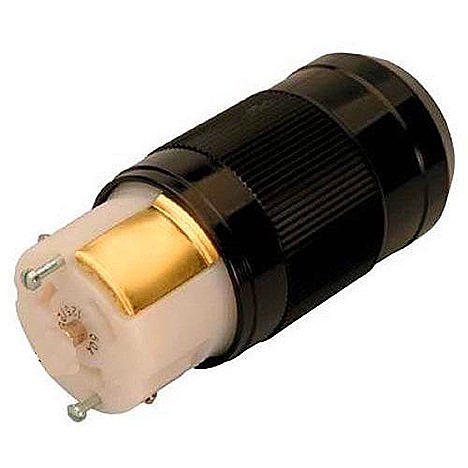 It looks like this plug had been replaced once before, before Nick and Terry owned the rig. And whoever had done it, had done it wrong. They had tinned or soldered the stranded wire until it was a solid clump. This is a big NO-NO. 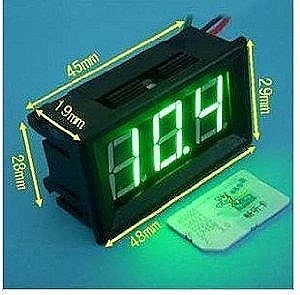 When the wire is a solid mass, it was no way to flex, expand and contract, with temperature changes. 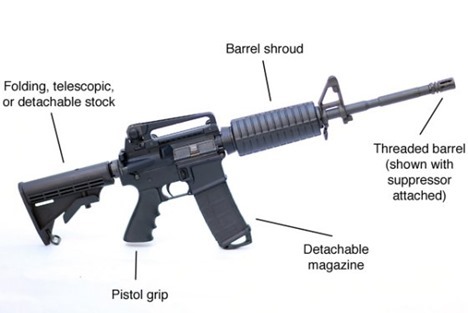 And over a period of time, this causes the connections to loosen, and then they start to overheat and melt. The replacement job took about an hour and went pretty smoothly. I cut back the insulation until I had bare wires again, and as I put it back together I sprayed all the connections with an anti-corrosion coating that should help keep problems under control. After powering up the rig and checking things out, everyone was getting hungry, so we picked up Jan at our rig and headed over to a place Nick and Terry wanted us to try called Streets of New York, a nearby pizza, pasta, subs place. Oh, and chicken wings too. We all had a little bit of everything. Jan and Terry had the Chicken Parmigiana, while Nick had his usual Pepperoni Pizza. I went with a small pepperoni, sausage, and mushroom pizza, and some Honey Hot Chicken Wings. We all agreed it was really good. Jan and I especially liked the Honey Hot Wings with a crispy crust on them. Tomorrow we’re going to try our trip to Tortilla Flat once again. 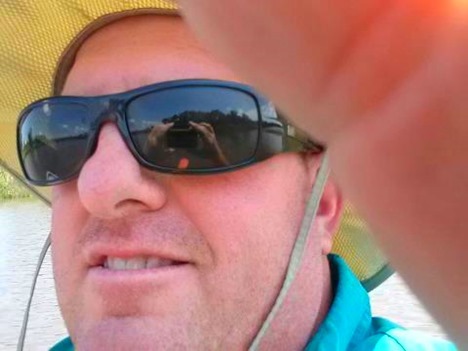 That is, if Nick doesn’t break something once again. The Northern Migration . . .
After the busy day yesterday, today was a good bit quieter. I worked on a few things around the rig, while Jan read her Kindle. Like I said, quiet. I bought some Reflectix foil shield the other day to help keep some of the heat out. We’ve got our solar screen up but they need some help. The way we’re parked we get sun in though the windshield all day, and with it supposed to hit 99 degrees on Monday, I’d like to give the AC’s some rest. Jan and I headed out about 3pm for some errands and dinner. Our first stop was a nearby Home Depot for a few project things, and a spring clamp for Miss Terry. It seems like every day it’s either Wal-Mart or Home Depot. Our next stop was CVS, and while Jan shopped, I sat in the Pharmacy waiting area and read a Kindle book on my phone. You gotta love modern technology. 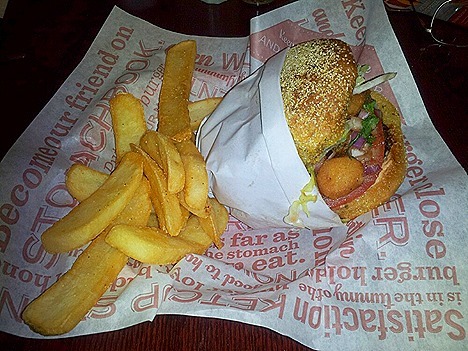 Jan had been wanting to get her Red Robin fix, so that was our next stop. Jan got her usual Cheddar-Mushroom Burger while I went for my usual Burnin’ Love Burger, with fried jalapeno slices, pepper-jack cheese, and a cayenne-seasoned burger. But I spiced things up a little more by sprinkling on some ground dried Ghost Chili salt. Really good. And hot. After we finished at Red Robin I used Gas Buddy to find the nearest, cheapest place for unleaded and filled up. $3.45 a gallon was good since I paid $3.59 a couple of weeks ago. Then I used Gas Buddy to track down and check out a couple of places to get diesel on our way to Las Vegas next Wednesday. Looks like a CircleK one block off the freeway will fill the bill, and the price right now is only $3.45 a gallon. Unusual for unleaded and diesel to be the same price. A while after we got home we headed out for our walk around the park. It’s really evident that the northern migration of the Snowbirds is in full flight. Every time we walk there are fewer and fewer rigs, and now even park models are being closed up and summerized. 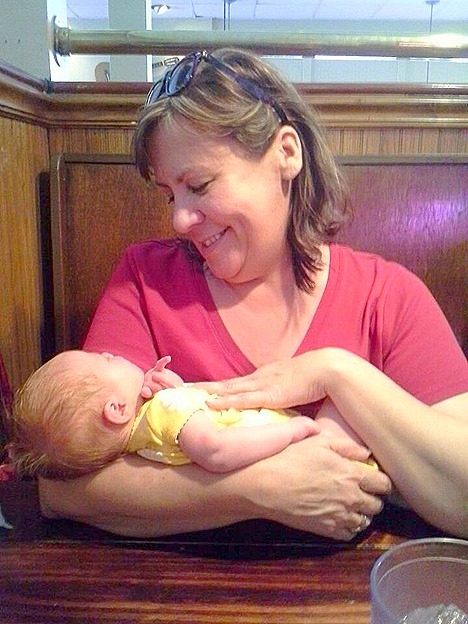 Landon’s Aunt Sherry is up in South Carolina, visiting daughter Grace and her husband, and getting her first chance to hold her new granddaughter Zoe. 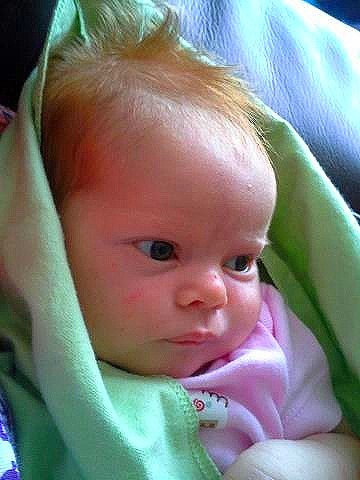 All that hair makes her look older than just a couple of weeks. I know Sherry is happy to get to see her. Sometimes Technology just makes you feel Stupid . . . Since we had a busy day planned, Jan and I headed out about 10am for our visit to the da Vinci exhibit. But our first stop was another visit to Over Easy, a really good local breakfast place. Jan had her usual eggs, bacon, and toast, but with their delicious brioche toast. 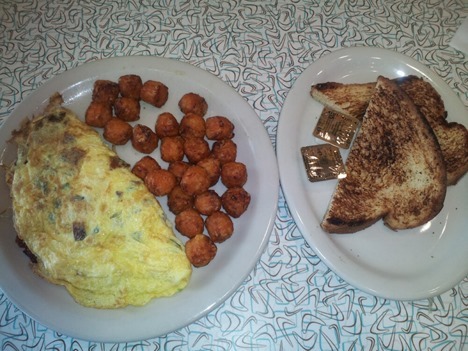 But I switched off to a bacon, sausage, cheese, and jalapeno omelet, also with the brioche toast. But I tried something a little different – sweet potato tater tots. And they’re really good. After breakfast I went to the restroom to wash my hands, and then stood there waving my hands at a box on the wall, silently cursing that it wouldn’t give me a paper towel to dry my hands. It took me longer than I would like to admit before I realized that I was supposed to just stick my hand up and pulled a towel out of the dispenser. A manual towel dispenser? What are they thinking? This is the 21st century. Leaving Over Easy, it was about 30 minutes to the Arizona Science Center where the Da Vinci – The Genius was on view. Parking in the garage across the street, we encountered these unused Electric Vehicle Charging Stations conveniently close to the elevators. 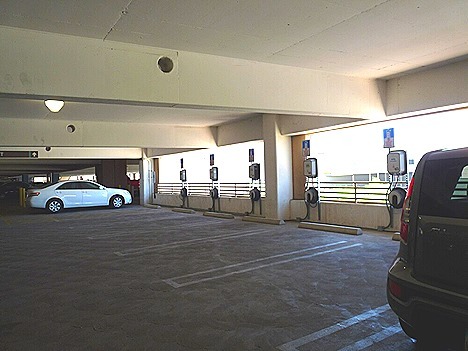 I thought about just parking here – conveniently close to the elevators – and just sticking the charging cable under the hood. I mean, surely someone makes an electric truck, don’t’ they? Getting across the street we first encountered about a million screaming kids. Apparently we picked Kid’s Science Day to see the Da Vinci exhibit. But luckily for us they were there for the many hands-on science exhibits in other parts of the the center. 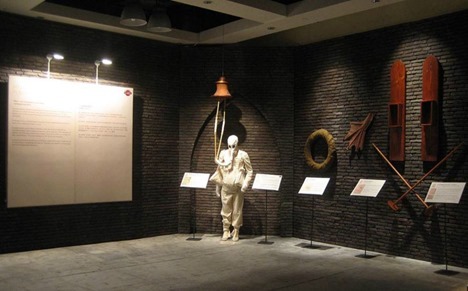 Entering the exhibit area, we quickly realized that this da Vinci exhibit was located in the same area of the center where we saw the Body Worlds exhibit in 2007. 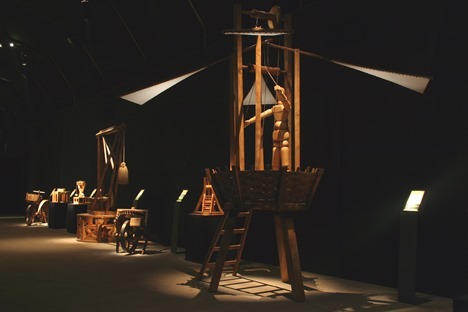 What I really found interesting were that they had recreated many of the drawings and inventions that sprung from da Vinci’s imagination. This first one is a diving suit, designed to allow soldiers to attack enemy ships in the harbor. 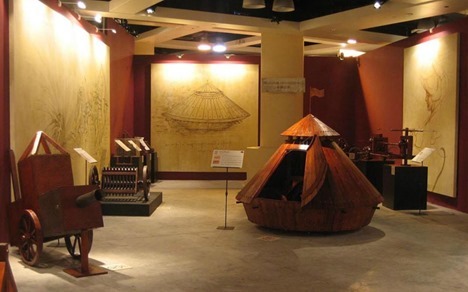 These are several of da Vinci’s war weapons, a steam-powered cannon, and small scale model of the first visualization of today’s military tanks. Here’s his idea for a glider. This one is a ornithopter, a flying machine that flies by flapping the wings. 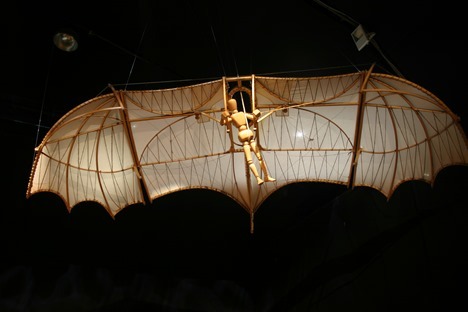 And here’s da Vinci’s other take on a vertical ornithopter. 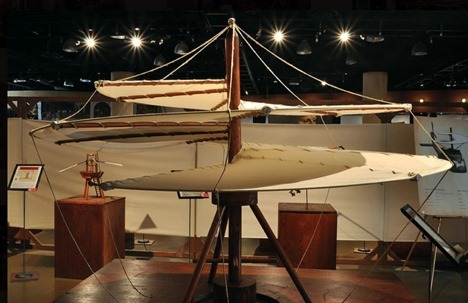 Here’s da Vinci’s Air Screw, his idea of a helicopter. Discovered in the 1970’s, the drawing of a prototype bicycle was first attributed to da Vinci, but it is now thought to be a hoax, though it is not known who the perpetrator was. 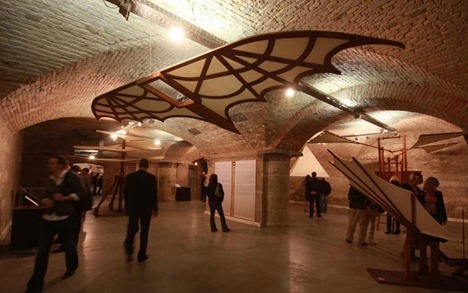 The last part of the exhibit was about what Leonardo da Vinci is probably best known for. 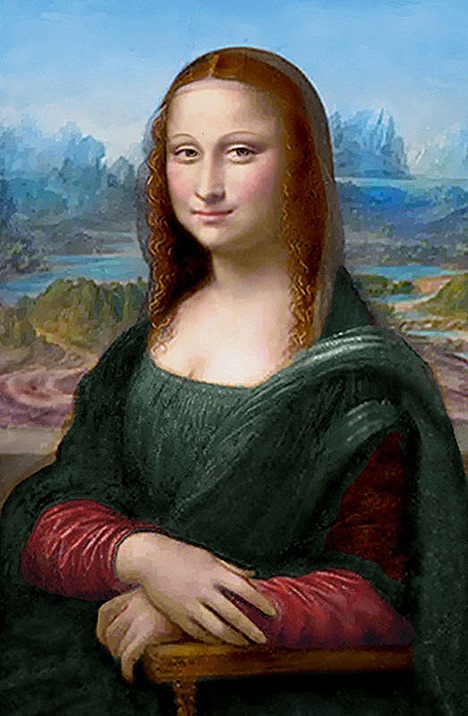 Here’s what the Mona Lisa looks like today. In October 2004, French engineer Pascal Cotte, founder of Lumiere Technology , was allowed to scan the painting with a 240-megapixel Multi-spectral Imaging Camera he invented, which uses 13 wavelengths from ultraviolet light to infrared. The resulting images peel away centuries of varnish and other alterations, shedding light on how the artist brought the painted figure to life and how she appeared to da Vinci and his contemporaries. 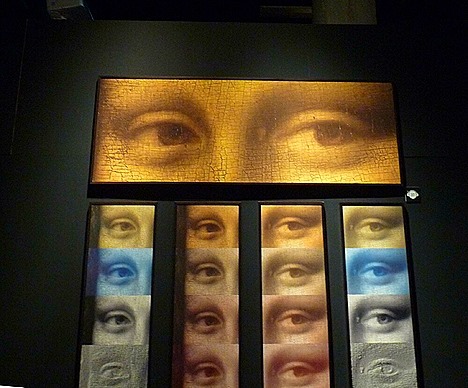 The photo below shows the many different layers of the Mona Lisa’s eyes taken with the Multi-Spectral Camera. And using it they finally found her missing eyebrows and eyelashes. 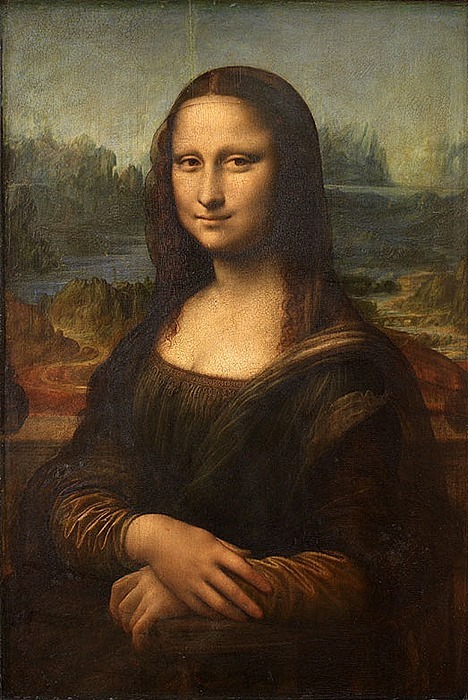 Art historians over the years have argued about why the Mona Lisa doesn’t have either. Women are known to pluck their eyebrows, but eyelashes? As it turns out, they were there to start with, but due to a different paint and painting technique, they have faded over the years. But her eyebrows and eyelashes aren’t the only things that faded. Take a look at what the Multi-Spectral camera shows the Mona Lisa looked like when it was painted. Quite a difference. And now she’s got eyebrows and eyelashes. We spent about two hours going through the exhibit and really enjoyed it. 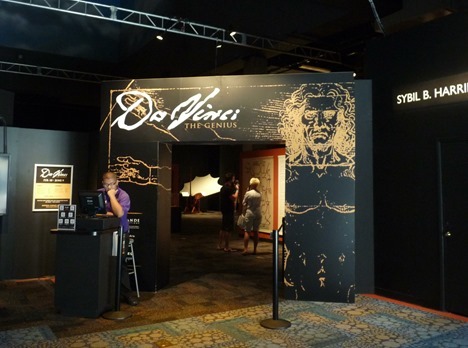 The Da Vinci exhibit is here in Phoenix until June 9th, so if you get the chance, check it out before it moves on. It’s worth it. We got back home about 2pm, and then about 5pm we picked up Nick and Terry and drove over to Los Gringos Locos to meet up with Ed and Alice Allard, and their son Mike. 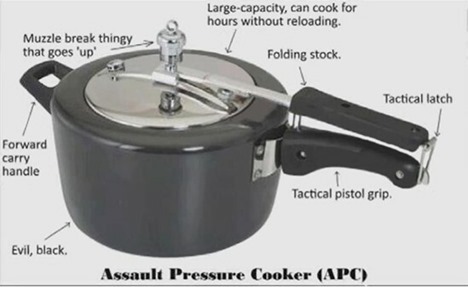 Now we’ve got Assault Pressure Cookers to worry about. I’ll have the Da Vinci, Over Easy . 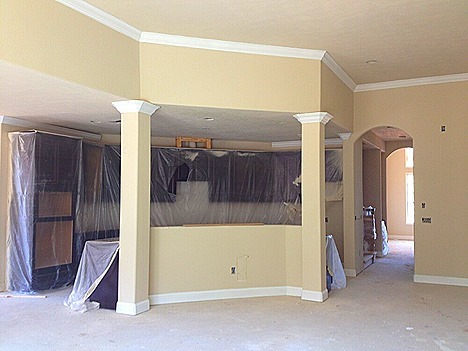 . .
Brandi sent over some more pics of the progress on the new house. 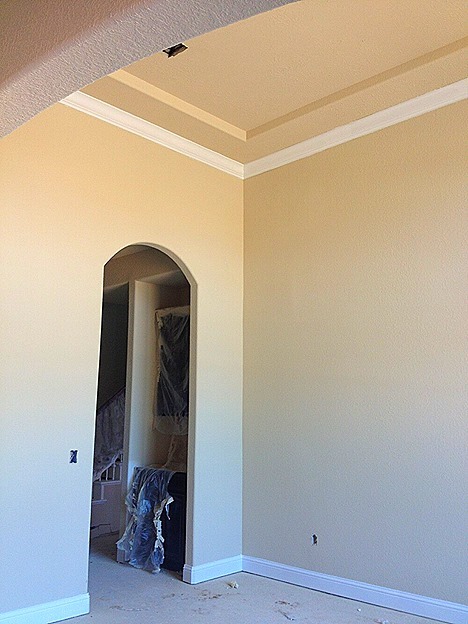 She said they’ve put another coat of paint on the walls, and started painting the trim. Looking good. I think they hope to be in the house in about 6 weeks. I know they’re really excited. I took it kind of easy today, didn’t do much, because I’ve had a sore back the last few days, one of those things where everything’s fine, and then you move just the wrong way and it feels like someone put a knife in your ribs. Hopefully it’ll be better tomorrow. I did head out about 1:30 to make a Home Depot run, along with Radio Shack, and an Office Max for Jan. Then about 6:45 we took off on our walk with a short detour by Nick and Terry’s to drop off a couple of things from Home Depot that I’d picked up for Terry. Then it was on our way to finish up our mile and a quarter walk, getting back just as it got dark. 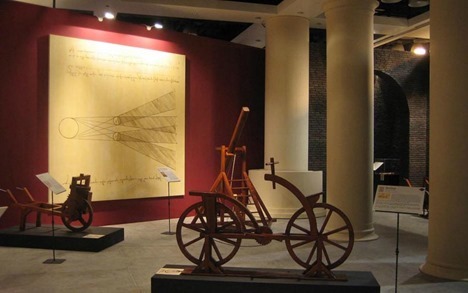 Tomorrow morning Jan and I are going to visit the Arizona Science Center to see the Da Vinci – The Genius Exhibition. This is a traveling exhibition that’s here in Phoenix from February to June, so we’re lucky our timing is good. The last time we visited the Arizona Science Center was in March 2007 when we had rented a CruiseAmerica Class C to check out RV’ing, and after attending the Life on Wheels training in Tucson, drove the RV up here to Phoenix for the afternoon to see the Body Worlds exhibit, the one with the real plasticized bodies in various poses. On our way to the exhibit, we plan on stopping for breakfast again at Over Easy, the breakfast/lunch place we ate at a couple of weeks ago.